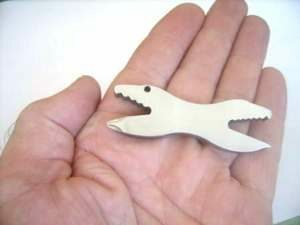 The MyArk Ti-6Al-4V Alligator Wrench is a key ring multi-tool made from Ti-6Al-4V, which is an alpha-beta titanium alloy with medium to high strength. The tool features a bottle opener, a ratchet wrench for nut sizes from 3/8”- 3/16” on one end and metric 10mm- 4mm on the opposite end (perfect for car battery terminal nuts) and a built in PK and flat head screw driver. It’s available now for $49. Nice idea…but it costs at least $30 too much. It does appear that their other very pricey tools are sold out…so there must be a market though. Its alpha-beta titanium machined from billet, I understand it’s manufactured by EDM wire cutting which cost $65 USD per hour. I operate EDM machinery, this would take over 45 minutes to cut one key ring if the plates are stacked. I found a web link on EBay to compare prices. I guess this is more of a “jewelry” type item than a tool. In much the same way as a Tiffany keychain can cost $100+.